Big Lots Alert! Thickers, Dear Lizzy, Basic Grey, etc. Word on the street is that BIG LOTS has THICKERS again. I found them the other day, along with a few other cool things. 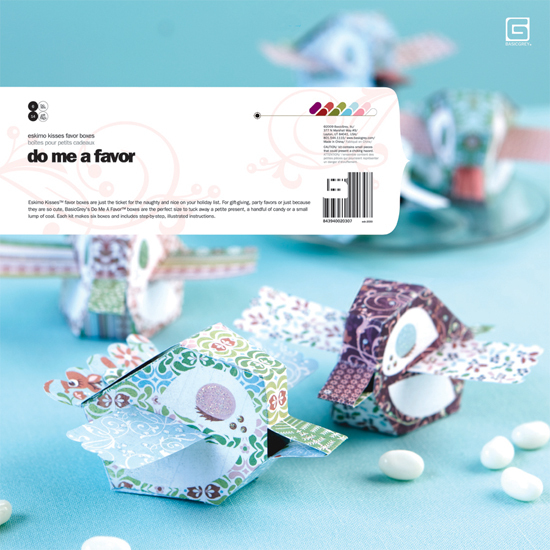 This is a Basic Grey’s “Do Me a Favor” favor boxes from the Eskimo Kisses line. Here’s the “official” product photo which shows what’s on the other side of the package, with the favors this kit makes. It retails for about $7 and I got for $1 … that’ll work. I don’t plan to make favor boxes ~ have no use for them ~ but I figured for a buck, I could use just the flower, heart, and journaling box punch-outs in my scrapbooking. Here is a varsity-style sticker alpha by American Crafts. You could use these on sports, cheerleading, or high school pages. Again, you can’t go wrong for $1, right? Ah, the target of my search: THICKERS! They were $2 a pack vs. the usual $4-5. 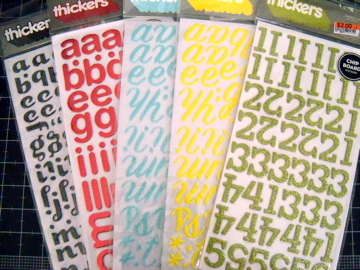 That’s why I love stocking up at Big Lots on my favorite alphabet stickers. I decided to get more than one pack of the black font since it’s so cute and different yet versatile. Don’t ask me what I’m going to do with a whole set of green glitter NUMBERS because I have no flippin’ idea … but but but … I got caught up in the Thickers Frenzy and just grabbed one of each that they had. Without thinking. Or using any discernment or judgment. Or common sense. Ah, what the hell. It was only 2 bucks. 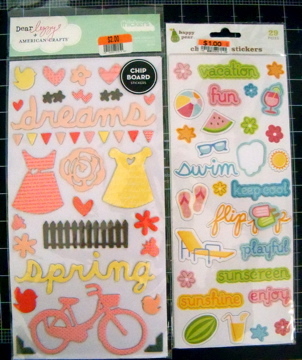 Here’s some darling Dear Lizzy and KI Memories chipboard stickers. Now that the rain has finally stopped and the sun is out, I’m itching to use these spring-y and summer-y colors. All this writing about Big Lots finds reminded me that I’ve never shown you pics from my last shopping trip there a few weeks ago. I just can’t get over their prices. I don’t care that this stuff is “so last year” or whatever. I enjoy seeing what the trends are but they don’t impact my scrapping one iota. If I like something and it’s cute, I use it. So I’m going to have fun with this “old” stuff. 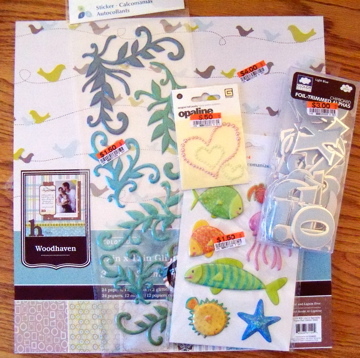 I bought the “Woodhaven” paper pack because it’s such a good match to the colors in my scrapbook area. I’m thinking of either framing some of the pretty papers as is, or framing some layouts made with them. 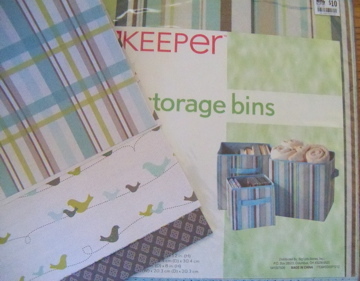 I also found these storage cubes made of fabric that uses similar colors. Here is one of the papers held up next to the bins on my shelves. The colors aren’t an exact match but they’ll do. 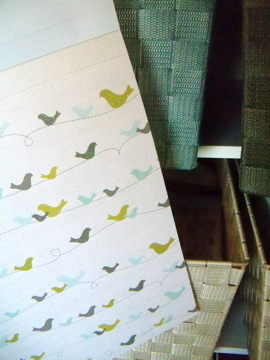 And I love the birdie designs … so pretty. So that’s my last two trips to Big Lots. 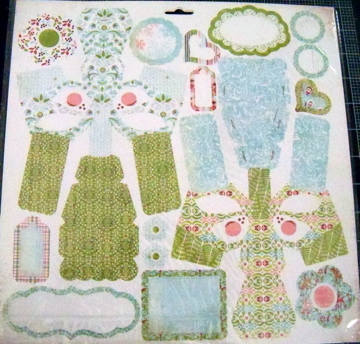 I think my favorite finds are the Woodhaven papers and the Thickers, of course. What have you found lately at Big Lots? Simple Stories: “100 Days of Summer” Available NOW!! WDYT? 1 Million Views of “Scrapbook Obsession” by 12-31-11? Holy guacamole, you sure found some good stuff at Odd Lots (that’s what my husband calls Big Lots). I want to shop at YOUR Big Lots. Ours has a paltry offering in comparison. But I will continue to check in, because, with that store, the name of the game is: you never know what you’re going to find! I love the Thickers, never heard of them before. I’m a bit of an alphabet addict – if anyone knows of a 12 Step program for me in Michigan, I’d appreciate it! Happy Shopping everyone! Ooo! Those are some great finds. I may just have to make a trip to my Big Lots today. Thanks for sharing! I got some Thickers on my last trip to Big Lots as well. I got multiple packs of a green alphabet, white alphabet, and black alphabet. They had a small selection, but it was nice. No luck with anything else, though. Congrats on your finds! I love that paper. Last year I found some fantastic stuff at my Big Lots. A lot of people really don’t think to look there for great stuff. Great blog! I am so jealous! We don’t have a big lots any where around here. Great deals…happy scrapping! I love shopping at Big Lots. You took in a great haul. You have just added another, good luck! Always love to see what you snagged on your latest scrappy shopping trip!!! Need to check out my BL and see if they have anything this good. I love the birdie design it’s so cool…and I like the favor boxes.